EDI standards enable a stable environment for two trading partners to exchange business documents by standardizing the format of the message. The Standards define the structure and order in which data should be presented, bringing in uniformity and coherence. This, of course, makes practical sense. You cannot comprehend the above message unless Amazon or Target clearly states that the first element denotes the line number, followed by the product name, vendor code, and the required quantity. Suppose that, with this understanding, you code your software to pick data from the corresponding fields. Now, this situation can be made worse if they change the order of these elements in their next purchase order because of the data presented in the new order conflicts with how you had programmed to pick data. This is an over-simplified example to demonstrate the need for standardizing these messages, be it purchase order, shipment notification or an invoice. Business groups who shared a common interest came together to create EDI standards which they could use in their respective industries. Some examples include the automotive industry which uses VDA, the retail industry that uses ANSI X12. 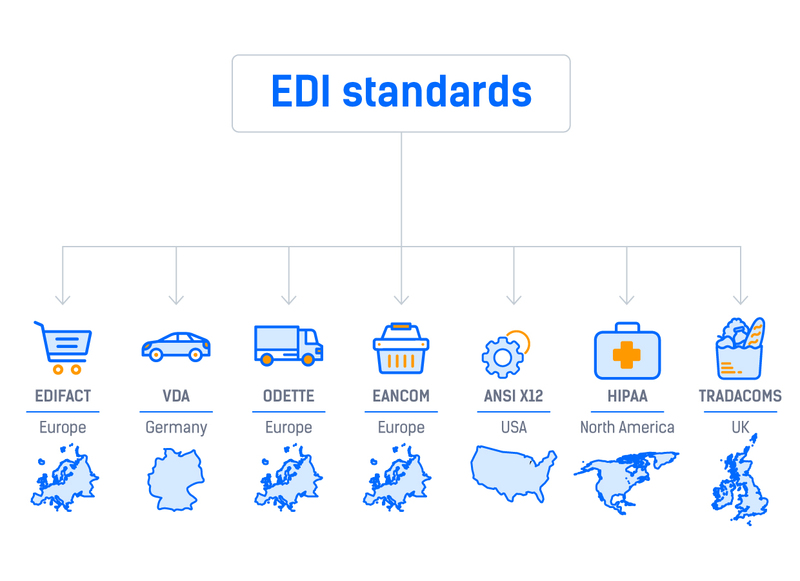 Let’s take a look at each of these commonly used EDI standards across different industries and regions. EDIFACT stands for Electronic Data Interchange For Administration, Commerce, and Transport. The United Nations developed the EDIFACT. It finds use in multi-country/multi-industry trading purposes and in an overall global context. The companies in Europe have been using EDIFACT for a very long time. Hence, the EDIFACT finds broad use in the European parts. UNEDIFACT is another term that refers to EDIFACT. VDA stands for Verband der Deutschen Automobilindustrie. It is the German automotive EDI standard. Widely used by the German Automobile companies for the transfer of their business documents, this EDI standard was very much popularized in Germany. Though they do not contain all the characteristics of a typical EDI message, the UK automobile supply industry accepted it. The automotive industries in Europe developed the EDI standard ODETTE (The Organisation for Data Exchange by Tele Transmission in Europe). It came about to facilitate the exchange of EDI documents with their trading partners. The communication standards such as OFTP and OFTP2.0 came about due to the popularity of ODETTE. EANCOM came about in 1987 as a subset to EDIFACT. At first, EANCOM was only for the retail industry. Later on, EANCOM was implemented in other areas as well such as health care and construction, etc. It soon became one of the most popular subsets of EDI due to its usage in various industries. 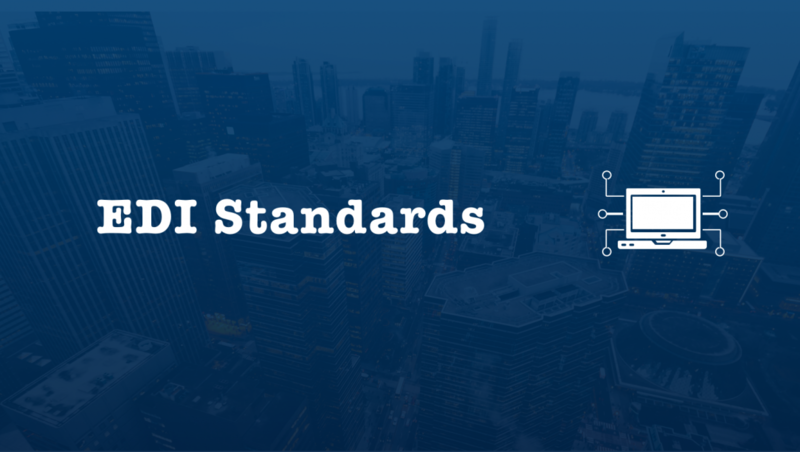 The American National Standards Institute created the EDI format ANSI X12. The ANSI X12 is more popular compared to other EDI standards. This is because ANSI X12 covers a wide range of industries ranging from healthcare to retail to even the automotive industry. The use of ANSI X12 started in the North American region. The other regions of the world also make use of ANSI X12 now. This EDI standard enables secure transaction of records. The healthcare industry uses it primarily. It also enables access for the patients to their healthcare information. HIPAA stands for Health Insurance Portability and Accountability Act. The TRADACOMs EDI Standard finds use in the domestic trading in the UK. The first version came about in 1982, and this EDI standard has some similarities with that of EDIFACT. In 1995, development of Tradacoms came to a halt. Yet the retail industry uses it even today. The types of EDI mentioned above are the main ones profoundly used by most of the business industries around the world. There are other EDI standards too such as SWIFT, VICS, etc.